This month we check back in on our crude oil spot prices in bubble map form – the first time we’ve done so since January. On October 10th spot WTI was quoted at $51 per barrel, with Brent $5 higher. Western Canadian Select was discounted at $13 under WTI. On the Gulf Coast, crude oil from shale formations in Texas like Eagle Ford were priced at parity with WTI, and Louisiana Light Sweet was at $5 over WTI. On the West Coast, the Alaska North Slope differential was $3 over WTI and the San Joaquin Valley Heavy discount was at $4 under WTI. 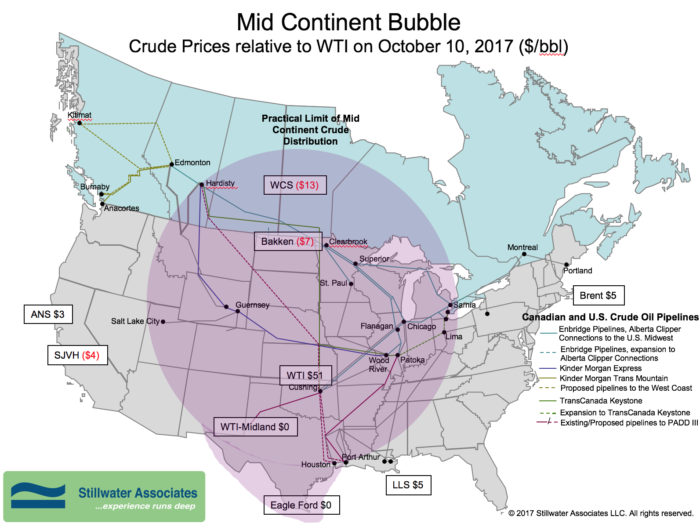 In stark contrast to this time last year – when imports were on the rise and the WTI-Brent spread was just $2 – this month’s bubble map shows evidence of the lingering effects of and recovery from Hurricane Harvey. Following Harvey’s devastation last month, one third of the entire U.S. refining capacity was taken offline. That paired with Harvey’s relatively slight effects on U.S. crude production makes for excess supply, which widened the price gap between WTI and Brent crude (it rose to more than $6 above WTI in the immediate wake of Harvey). One additional impression at Stillwater is that East Coast and Western Europe refineries ran harder after Harvey to make up for the lost Gulf Coast product production. This contributed to driving up the Brent price. That being the case, U.S. crude may be boxed in to export alternatives due to decreased Gulf Coast consumption (lower relative U.S. crude prices) and higher Brent demand in Europe (higher Brent price) widening the WTI-Brent spread. We’ll continue to watch and analyze all the changes to the transportation fuels industry that come as we head toward the close of the year.